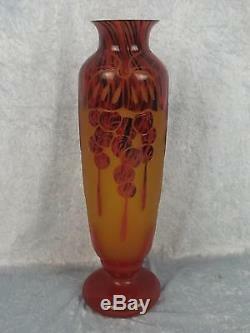 Circa 1930 Le Verre Francais Groseilles Pattern Cameo Glass Vase. A Le Verre Francais vase made by Charles Schneider. The vase, dating to circa 1930, is in the Groseilles (red currents) pattern with acid etched & wheel engraved fruit in a reddish brown melting down against a yellow ground. The lower quarter and upper quarter are of the same solid reddish brown and the flowers are highlighted in pink. The edge of the foot is engraved "Le Verre Francais". Le Verre Francais is one of the many types of cameo glass made by the Schneider Glassworks in France. The glass was made by the C.
Schneider factory in Epinay-sur-Seine from 1918 to 1933. The vase has a height of 15 inches (38.1 cm) & the base has a diameter of 4.5 inches (11.4 cm). It weighs 1.54 Kg. The vase is in excellent condition. Please see further images below for condition.. The item "Circa 1930 Le Verre Francais Groseilles Pattern Cameo Glass Vase" is in sale since Friday, April 22, 2016. This item is in the category "Pottery, Porcelain & Glass\Glass\Art Glass\French\Other French Art Glass".